One of the advantages of using a Geographic Information System to map entities like war memorials is that you can create maps based on any particular criteria stored in the database. This gives us the ability to ask certain questions of the data in order to answer specific questions. A way to approach this is to map mentions of the main local regiments to see if any patterns emerge. 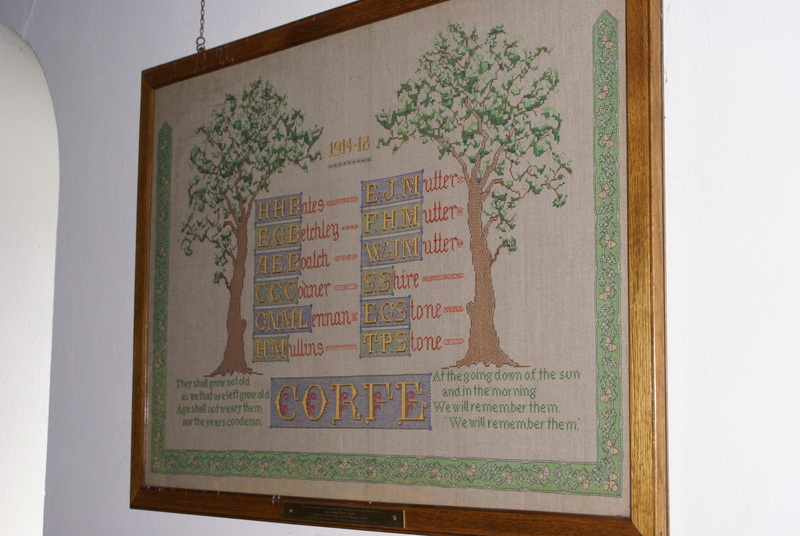 The prominent local regiments were the Devonshire Regiment and the Somerset Light Infantry, as well as the Yeomanry of West and North Somerset, below combined with the SLI for ease of use. 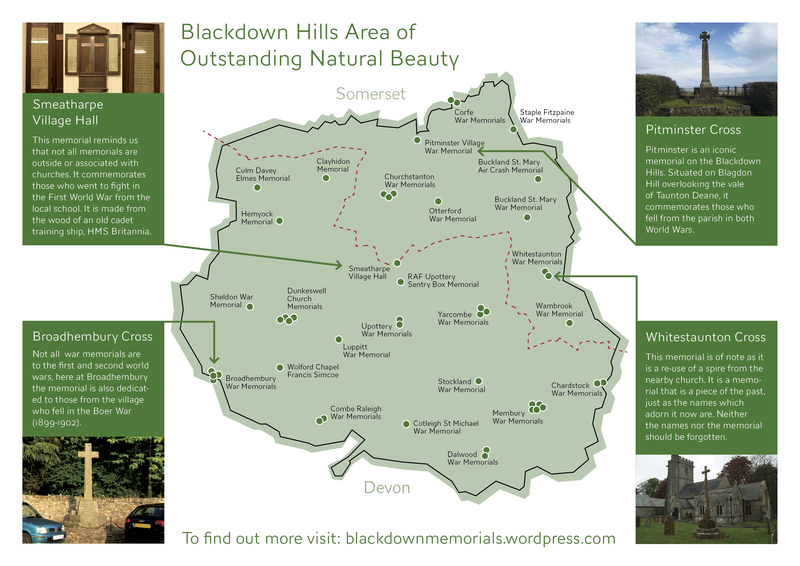 The locations of war memorials in the AONB that mention The Devonshire Regiment (represented by the regimental badge). Devon – Somerset border shown as dotted green line. The locations of war memorials in the AONB that mention the Somerset Light Infantry or associated yeomanry regiments (represented by the regimental badge). The Devon-Somerset border is show as a dotted green line. From these results it can be seen that the recruitment into the Devonshire Regiment appears to respect county lines. By contrast men serving in the Somerset regiments were from all over the AONB. A massive drive was made in 1914 to recruit as many men into the ‘New Armies’ as possible. Recruitment centres were set up and men came from miles around to sign up – many expected to be home by Christmas. The main centre for recruitment into the Somerset Light Infantry was in Taunton, about 10 miles north of the AONB. The SLI expanded massively, from having two Battallions and one Reserve in early 1914 to eight Battallions on active duty by the end of the same year. The Devonshire regiments along with their respective Yeomanry forces did the same, also expanding exponentially, with their focus on Plymouth and Exeter to the south. Recruitment into the Forces (the Army in this case) was simple enough, but the internal workings and needs of different regiments once you were in was entirely different. Although a man might initially sign on with the Devonshire Regiment there was no fixed guarantee that that man would stay within that regiment. In Broadhembury for example there are two officers who died whilst serving in the West Kent Regt., despite having signed up in Devon. These men were officers, and were most likely moved to fill a gap in officer numbers sometime during the war, possibly after deployment to the front. Privates and NCOs were reallocated much less often, but when they were it was usually according to individual skillsets. We must keep in mind that the men that signed up in 1914 were not unemployed previously. Many of them came from working class but skilled families of blacksmiths, farriers, carpenters, or mechanics. These were all very highly sought after proffessions and men were moved from regiment to regiment to replace any gaps which occurred. If this was the case on the Blackdowns any movement of men may well have occurred before troop deployment; for example if the Devons had 13 Carpenters and the SLI only had 5, some balancing of books might take place. This would enable any specific skillsets to move from the Devonshire Regiment to the next closest, the Somerset Light Infantry. The recruiting process was simple, but the intentions of the human mind are not. Many men signed up with the regiments they held closest to their hearts; perhaps a relative had served with a certain regiment previously; perhaps historic greviences within the family meant a mind was swayed; maybe the distinction of Light Infantry was appealing? 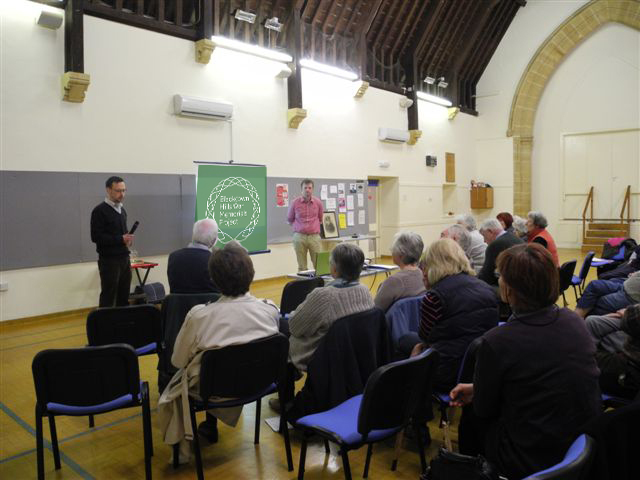 Researching individuals was not part of this Project’s remit; we cannot tell if someone in Broadhembury identified more with Somerset than Devon; we cannot tell if that person commuted that way and so signed up in Taunton; but what we have done is present the information that we know in a clear, accessible form that everyone might use to answer these and other questions. NB: It should be noted that not all memorials mention the regiment of the soldiers. These maps were made using the available evidence and this is assumed for the purposes of illustration to be representative of the true situation. It should also be noted that the data includes names listed on rolls of honour, a subset of the whom were lost in battle. Thank you to everybody who contributed to the publication, which we hope will raise awareness and promote preservation. 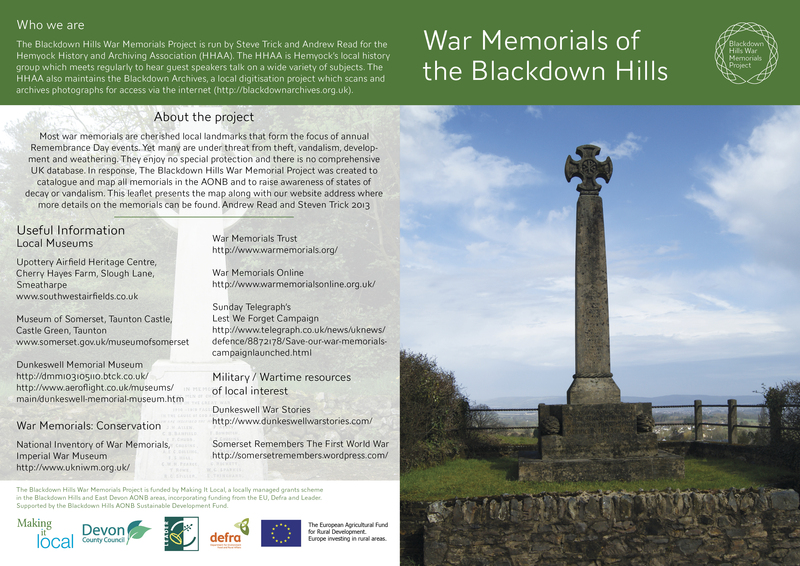 Watch this blog for further postings on the war memorials of the Blackdown Hills.